I have written a lot of articles about gemstones, rocks and crystals for this site that describe which ones are best for prosperity, love and protection. If you look back in the archives here, you will find lots of information about gemstones, crystals and semi-precious stones and their magical purposes. This article teaches you how to make optimum use of these natural allies of the spirit. First of all, when you go to a new age or gem store, you will usually find baskets or drawers filled with various kinds of gems. Tumbled stones are usually the cheapest and feature lumpy rounded surfaces. Points are gems that have been cut so that they resemble a geometric shape or a small tower. The most important thing is to pick up the stone and see if it feels right in your hand. One stone might feel somehow "better" than another. The process of feeling energy from an object by holding it is called "psychometry." It is very common to set foot in such shops and then step out again holding a bag full of stones that are quite different than the ones you originally intended to purchase. Don't worry, as this is quite common. Many of us make decisions about which stone we need to heal by reading a diagnostic description and then feel a certain rock or crystal "call out to us" in the store. Half of the time that is the remedy for the situation that you really need. For instance if you set out to buy Chinese Jade for money drawing, but instead walk out with a nice big hunk of Rose Quartz (which is more for emotional healing), the fact that you chose this stone might open your way for abundance. It could be that the quartz is a somehow more suitable coin it may soften a "block" you have inside with regards to prosperity. As this is not a pure science, you are well advised in this situation to follow your gut instincts and have faith in the universe. If you find yourself attracted to a certain color of stone, pay attention as well, as it may reflect a color that is missing in your aura. For instance, an attraction to red or pink stone might represent a desire for more love and security in your life whereas an attraction to a purple stone might mean you are ready to advance on the spiritual path. Once you have your stones, it is important to cleanse them of any energy they may have picked up in the past. Crystals are little storehouses that can collect various forms of energy and they may have been touched, handled or meditated upon before you bought them. Quartz crystals, in particular, can just pick up vibes from an environment. There are four main methods of clearing crystals. Perhaps the easiest and quickest method for clearing stones, especially crystals, is simply to place them outside in direct sun for one full day. Bury the crystal in a jar or bowl filled with sea salt and let it sit overnight. Do not use the salt for cooking or ingesting or bathing in after this though. Some prefer to soak the crystal in seawater. If you live near an ocean that's great, but you can make your own 'sea water' by just adding a couple of spoonfuls of sea salt to a container of water. The best container for either procedure is glass or ceramic. Don't leave your stones or crystals in there more that 24 hours as too much salt can cause a crystal to start growing a limb or developing a seam. After 24 hours rinse the crystals with water, preferably spring or distilled water. Smudging a crystal involves passing the crystal through smoke. Usually the source of the smoke is a burning bundle of cedar or sage (this can also be purchased in new age or health stores.) You can also clear crystals using the smoke from rosemary, sage, frankincense, myrrh or Tibetan temple incense. This ritual finds its origins in both Native American and pagan traditions. Hold the crystal in your dominant hand, or if you bought a huge one, in both of your hands. Focus your thoughts on the crystal and imbue it with the intention of freeing it of all negative influences and energy. As you hold this intention in your thoughts, inhale forcefully through your nose and exhale forcefully on the stone. The idea is that your breath cleanses the rock and makes it your own. This is an Eastern as well as Nordic tradition for clearing objects. It will only work if you do feel truly connected to the divine as you are doing it. If you easily attach emotions, resentments, or are in a bad mood, save this technique for another day. After you have cleansed your crystal, you need to "charge it" with your intention. There are ways of doing this and you might want to use your imagination. For some charging a crystal is a simple as holding it in your hand, meditating and pouring your intention into it. 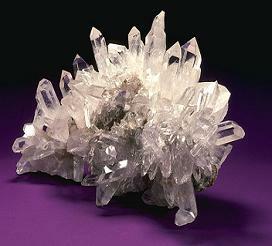 Single crystals or stones may also be charged by placing them on a cluster of crystals that have already been charged or on an altar that has been dedicated to the Divine in some way. The changing of crystals is a personal matter and it is vital to use your imagination when it comes to know how and where is the right time to do it. After you are done charging the crystal, keep it close to you, and soon you will start to notice subtle changes within yourself. Sam Steven's metaphysical articles have been published in many high-standing newspapers and she has published several books. You can meet Sam Stevens at http://www.psychicrealm.com where she works as a professional psychic. You can also read more of her articles at http://www.newagenotebook.com where she is the staff writer. Currently she is studying technology's impact on the metaphysics.